Many people love the all cotton futon. 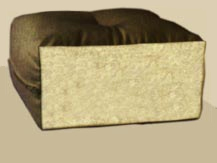 This is truly the original futon mattress. All of our futons are hand tied and tufted to keep the layers of cotton batting in place and to retain its shape over long periods of time. The all cotton is available from 3" up to 9" thick. WE use a blend of long staple fiber cotton and the lighter fluffier fibers known as gin flues or motes. This combination of cotton fibers allow the all cotton futon to keep its shape by using the strength of the longer fiber cotton (Pima cotton) and still retaining loft and resilience by also using the lighter fluffier first cut linters cotton in the cotton batting blend. In order to achieve the desired loft and resilience which needs to come into play, we add the gin-flue linters cotton. This combination of long staple and gin flue linters cotton blending is the best for making a good strong comfortable all cotton mattress. We also make 2-3" cotton toppers to use on top of memory foam mattresses or other foam mattresses people have bought on line. 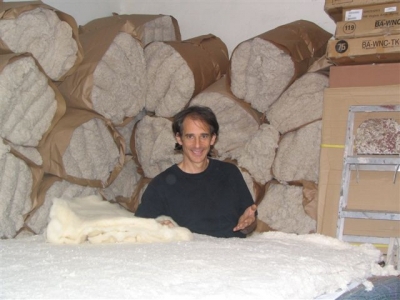 An all foam mattress does not dissipate heat very well so having a cotton mattress topper on there is a big plus for the hot Phoenix summers.